Q Dental Manly was founded in Mt Gravatt in 1992 by Dental Prosthetist Peter Fuller. It was originally a laboratory that created dental devices, Peter soon saw a need for excellent dentistry in Manly West and Manly, Wynnum. Since then, he’s opened a state-of-the-art dental clinic to serve the needs of all ages, from children to grandparents. As our patients began experiencing the exceptional care we offer, we’ve added dentists to our staff to serve them better. We’re a one-stop-shop offering a multitude of dental services, including cosmetic dentistry, prosthodontics, general dentistry, orthodontics, and implant dentistry. We also see children, with a pedodontist available on staff to deliver care that teaches them healthy habits early on that will maintain their oral hygiene in the future. If you’re living at a nursing home, we offer outpatient visits or a courtesy car to bring you to our clinic, if necessary. 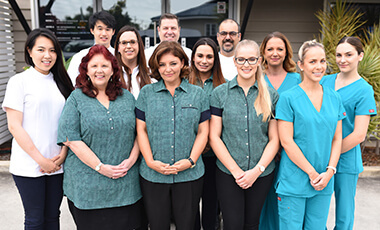 We enjoy being a part of the Manly West community and are involved with local hockey clubs and rugby leagues, supporting them and providing outstanding dental services to all who need them. We want to make sure that everyone in our community has access to excellent dental care. Preferred provider with smile.com.au, HCF and nib. Schedule your appointment with our gentle, experienced dentists today! We look forward to discussing your goals and giving you treatment options to achieve your desired outcomes.